You must make reservations at least 5 minutes in advance of the time at Metropolis Cafe. Between Clarendon St.and Dartmouth St. Restaurant is available LUNCH starting at $15/person and DINNER starting at $25/person for semi-private dining, or private dining for groups of 10 to 40 people (both prices exclude alcoholic beverages, tax and tip). A cozy and casual cafe overlooking bustling Tremont Street, in Boston's Historic South End. Offering our guests fine dining, hospitality and casual dining prices. We serve dinner nightly including a popular neighborhood brunch on both Saturday and Sunday. Old Neighborhood pastrami, hashed with potatoes and onions, two eggs, any style, iggy's rye & "1000 island"
Amazing restaurant! What a great find in the South End. Excellent service. Michaela, Ashley always deliver excellent customer service. Always delicious and welcoming. Great new spring menu. This is my go-to for a Boston small-group-of-friends brunch or dinner. The food is always delicious. The wine selection on point (spring for their Sancerre if you can), and the mixed beverages are limited but super tasty. The entry way is small and abrupt, the booths and tables on the smaller side, so if you're a wide-framed person, be prepared. Dining at the bar is a lovely option. The wait staff are super knowledgeable. Overall, not an overwhelming number of options, but everyone who dines with you will find something they like. For Brunch, try the BBH. If you want to explore a true French restaurant, this is it . From the salad to the desert everything was excellent , especially our server Ashley . We will be back soon. A really nice meal. The place is very cute and nicely decorated. Very good service. Cute neighborhood to stroll before or after dinner. We would definitely return. Still my favorite restaurant. I'm never disappointed. 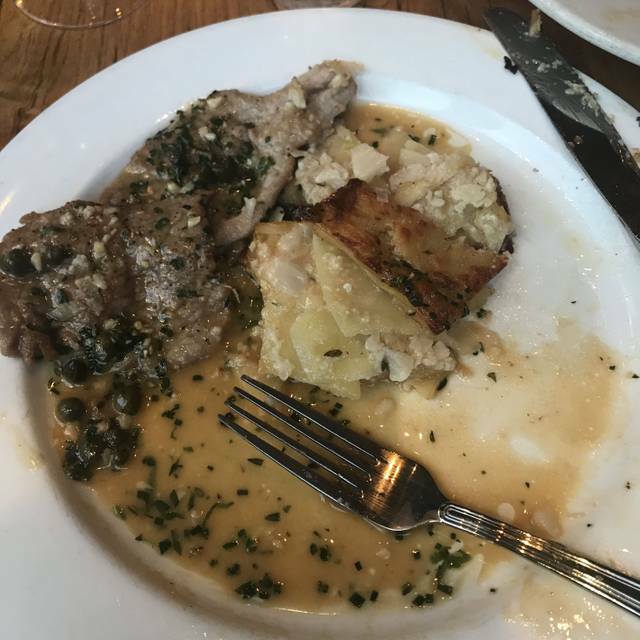 Their veal scallopini with capers is the absolute best anywhere. Always great service. Delicious appetizers and entrees. Ambiance reminiscent of being in French cafe. Look forward to going back. We had the prix fixe menu and between the four of us, tried all of the offerings. Everything was delicious. Great and friendly service and delicious food! Can't wait to go back! We both got the prix fixe menus, and that was a very good deal. Some of those choices were outstanding (the salad, soup, salmon and the cake), and others were fine. Service was very friendly but could have been a bit faster. We needed to remind the waiter one time that we had asked for more ice. Ambience and noise level quite fine. Great, reasonably priced restaurant. A great place to go before a show at the Caldwell center in Boston. Great wine selection, our appetizers were great, my husband’s ribs were great, the trout was a bit underwhelming. Great dessert. Our main complaint was the tiny tables and sitting space. First time and everything was terrific. We all loved our entrees...excellent service and cozy ambience on a cold Boston evening. Metropolis Cafe was a wonderful spot! We started with bread and fresh hummus with a bowl of cauliflower soup. I am a vegetarian so I was very impressed with the veggie friendly offerings. For entrees I had the butternut squash risotto and my boyfriend had the short rib. Both entrees were excellent and very well prepared. We were too stuffed after those two courses to try their dessert menu. Cocktails were delicious as well as a great wine selection. Also important to note that the prices were extremely reasonable for the area and the portion size. But only to a very good friend. I don't want Metropolis to get so crowded we can't get a table on somewhat short notice. Micaela is a magician, and our favorite server outstanding! The Brussels Sprouts appetizer as well as the rigatoni entree were plate licking excellent. The cauliflower chowder not so much, it was served room temperature and didn’t have much flavor. this was a remarkably busy night -- Sunday at 5:30 PM -- with a dine-in Boston menu for $33 apiece that was well-chosen and quite good. The wait staff was pretty busy and initial service was very slow -- but then things got going. This is a fun neighborhood-type place which we always enjoy coming to. My husband and I went to Metropolis after a matinee at the Lyric Stage. Metropolis has a varied vegetarian, seafood, and meat eaters menu that appeals to both of us. Metropolis also has a decent list of wines by the glass. It’s a small space so you do feel a bit cramped, or you can decide to feel cozy and intimate instead. The service was attentive, and the food was extremely good. 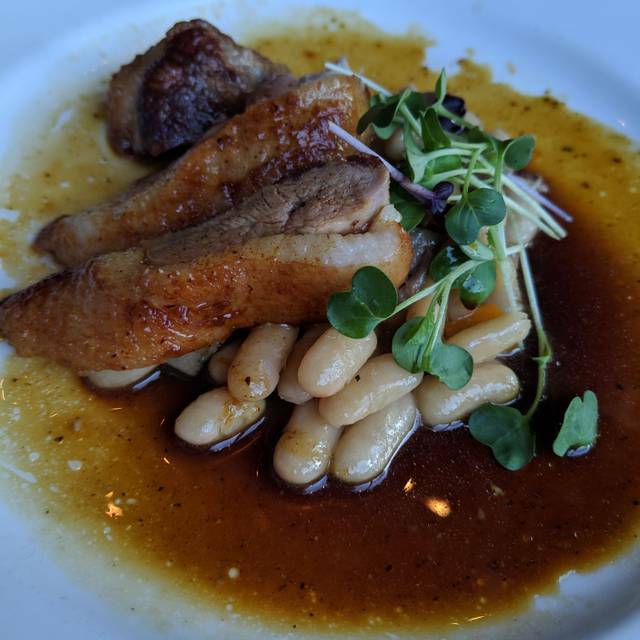 The duck breast was rare and also tender. The beet and pear salad was wonderful and the cauliflower chowder was complex. We will be back. Metropolis is a consistently wonderful meal! This is one of our favorite restaurants. The atmosphere is intimate, the food is fabulous and, usually, the service is accurate and responsive. For this meal, our server was pleasant, but our food arrived Luke warm, rather than piping hot, (which made us think it had come out of the kitchen 5-10 minutes before the server gave it to us) and he forgot our coffee orders until we had finished dessert and reminded him. I'd still give the experience 4+ because of the positives. And it will not change our view that this is one of our absolute favorites. Just posting this so that the restaurant can work on a little training of the servers. Metropolis Cafe has always been one of my favorites. The food is always reliably good and the ambiance is lovely - quiet enough to have good conversation which is becoming very rare. Whenever company comes or I am meeting someone for dinner, this is my first pick. Never disappoints! As soon as I leave, I already can’t wait to go to Metropolis Cafe again! One of my most favorite restaurants in the city!! Consistently outstanding food. Very friendly service. Metropolis Cafe is turning into our favorite local restaurant! Great food, great service. Charming locale. Food was delicious, and the service was kind and helpful. Had a great experience! We always have an excellent meal at this neighborhood gem. The only downside is the the valet parking is across and down the street and tends to be extremely slow. We have been eating at restaurants for well over fifty years. Four of us ate at Metropolis Café last Sunday, and the meal was the second poorest I have had in fifty years. Rarely do I write a poor restaurant review, but the meal last night was so bad, I felt I had write this. Two of us had the meager cider-braised short rib, which was dry, stringy and tough. The meat was served on a bed of a tepid, tasteless white puree, said to be potato – perhaps made from a box product. The two were surrounded by a thin, tasteless brown liquid. The puree was topped by two ostensibly roasted carrots. One was partially cooked, raw in the center and the second could not have been in an oven for more than a few minutes. Neither had been roasted with any meat juice, butter and anything that could provide flavor. There was no seasoning to be tasted. My wife had the squash and apple non-risotto “risotto”. The risotto was made with plain, white rice, seemingly cooked in water, not a vegetable broth, and served over a bland squash puree. Mild chunks of apple were mixed in the rice. Most uninteresting, and my wife left most of the dish uneaten. The highlight of the meal was the bread, possibly Iggy’s, which we all ate as the meal mainstay. One of us asked for butter, which was served as patties wrapped in foil. The cost of the meal was excessive. The service was good, friendly, but not overly so. The wait for the dishes was long, perhaps 20-30 minutes, especially so since none of the dishes was likely cooked to order. It is difficult to believe this restaurant can survive for long. There must be far superior restaurants in the South End. Excellent every time. We count on a good time when we are lucky enough to get a reservation.